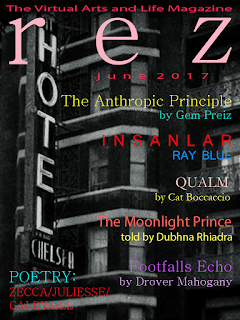 In this June issue of rez Magazine, we once again are blessed with some remarkable writing. Dubhna Rhiadra continues to spin her tale of love, passion and intrigue with the second installment of her truly wonderful parable, The Moonlight Prince. Please dig back into our website’s archives to read the first installment in the May issue. There’s not a better example of storytelling that I know of. Jullianna Juliesse brings us another of her wonderful poems, this time Litha, which proves she’s one of the most enchanting poets we have. And equally remarkable is the extended treatise, The Anthropic Principle, a pithy bit of fiction from Gem Preiz, who has brought us some of the most tantalizing images we’ve ever seen, from God knows where. Cat Boccaccio did a beautiful job with her graphics on Gem’s piece. You will be richly rewarded for giving Gem’s piece your serious attention. Give Cat Boccaccio a single word in her contribution, Qualm, and watch one of our treasured writers take it from there, dazzling us with her sense of whimsy. Ray Blue contributes one of the finest examples of the space/time continuum to date in Insanlar (hint: turn it up!). In the eighth installment of Footfalls Echo (8. Sunrise), Drover Mahogany takes us inside an Australian nature preserve in the magical hour just before the dawn, when Nature is in its most enigmatic state. OMG is a fantastic poem by Mario Zecca, who shares his thoughts about the world’s diverse religions and leaves us in a state of grace. And finally, in her piece Chelsea, Consuela Hypatia Caldwell pays tribute to the Chelsea Hotel in New York City, a bastion of artistic exuberance. All in all, a wonderful issue that we bring to you, mindful of our duty to entertain, but also to inspire.